Transform an ordinary bathroom into your personal sanctuary. Having trouble figuring out how much light you need in the bathroom? Experts recommend a minimum of 150 watts of incandescent lighting or 40 watts of fluorescent per sink. Decorative sconces that either match or complement the over-the-sink light will evenly illuminate both sides of the face. The most critical area for proper lighting is at the mirror, where the majority of grooming tasks – from make-up application to shaving – takes place. Although many builders and interior decorators install one recessed light over the sink, this is not ideal for putting your best face forward. Are you frustrated by uneven shadows or glare when looking into the mirror? Replace old light fixtures with new ones that provide cross illumination for shadow-free lighting. If you have a singe ceiling-mounted fixture over the vanity, or a light bar over the mirror, and don’t want to cut new holes for electrical connections, you can mount a track over the existing electrical outlet and hang one fixture over the sink that includes pendants hanging from either side. Do you knick yourself while shaving in the shower or tub? Lighting in the shower stall and over the tub should be bright enough for cleaning, shaving and reading shampoo labels. If you have an older home, built before UL-rated bulbs were available, add some recessed downlights designed for use in wet areas, and put shields around them. Shielded fixtures will protect reclining bathers’ eyes from glare. An adjustable accent light aiming from outside the tub is dramatic, glare-free and great for those bringing books to the bath. Is the unit housing on your bathroom’s overhead exhaust fan yellowed and cracked? Decorative exhaust fans and fan/light combinations are available that look good and help dress up the room. You can coordinate the unit with your faucet and other fixtures, even the tile on the floor. Is the bright light a problem when you go into the bathroom in the middle of the night? Install a dimmer. This is easy and inexpensive, and makes a huge difference, not only for the comfort of your eyes, but provides a beautiful decorative element. Another idea is to install a low-voltage linear lighting system in the toe spaces beneath the vanities and cabinets. This creates an elegant glow while providing enough light to find your way. In an era when going away on vacation may not be in the budget, many homeowners are finding it makes fiscal sense to turn the master bath into a spa environment with high-end amenities such as soaking tubs, saunas, whirlpools, bidets, granite countertops, double sinks, marble and tile flooring, and his and hers dressing areas. If you don’t have the resources or desire to take on a major remodeling project, you can still create your special space. Even simple changes like adding a vase of flowers, plush towels and scented candles can help make you feel like you’re being pampered. Try changing the wall color, hanging a dramatic mirror, adding draperies or using a decorative rug. For a greater impact, without too much more effort, you can install a pedestal sink or replace a light fixture. 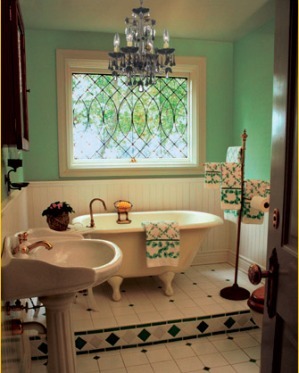 And nothing says luxuriousness like a chandelier over the tub. When selecting bathroom lighting, be sure to consider an ambient light source as well as task lighting. It’s one thing for a decorative fixture to be attractive. Just be sure it provides good light as well. These days, soft contemporary styles are leading the pack.